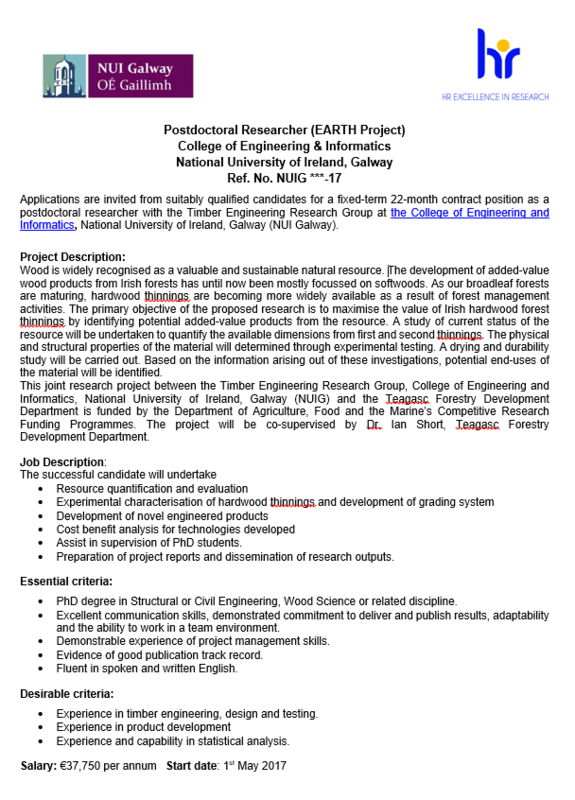 Applications are invited from suitably qualified candidates for a fixed-term 22-month contract position as a postdoctoral researcher with the Timber Engineering Research Group at the College of Engineering and Informatics, National University of Ireland, Galway. This joint research project between the Timber Engineering Research Group, College of Engineering and Informatics, National University of Ireland, Galway (NUIG) under the supervision of Dr. Annette Harte and co-supervised by Dr. Ian Short of Teagasc Forestry Development Department. This project is funded by the Department of Agriculture, Food and the Marine’s Competitive Research Funding Programmes.